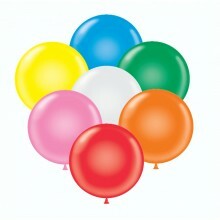 Need a case quantity for Tuf-Tex balloons we don't yet stock? Have a look in the Tuf-Tex 2018 Catalogue, and we can order in case quantities for you with our next order. Call Sales on 01483 808 121 to discuss your requiremtns further. Premium Quality TufTex® 17" Standard Assortment (With White) Decorator Ball.. Premium Quality TufTex® 24" Standard Assortment (With White) Decorator Ball..